I am the dark side! Caprioril and Kaikielius have fallen. Renegade Imperials troops are under siege on Coruscant. 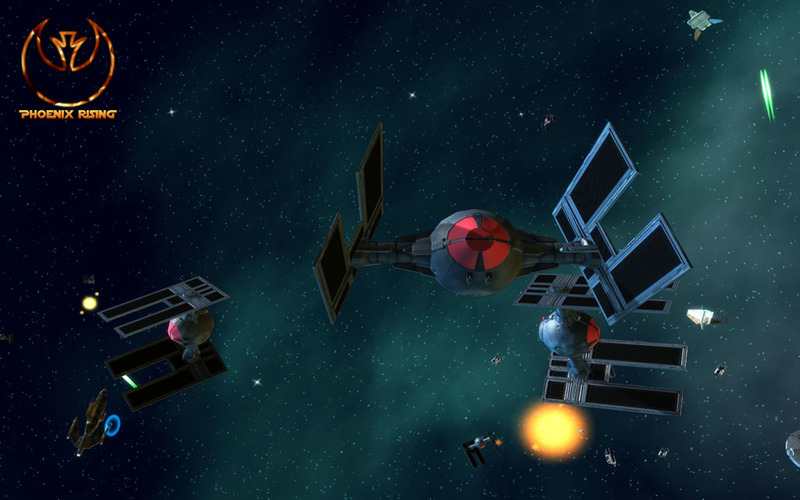 Imperial strike fleets led by Klev’s Silencer-7 and Pellaeon’s Chimaera are poised over Nyasko and Abregado-Rae respectively. The Dark Side Elite await orders on Vjun and Prakith. Orders have gone out to annihilate all traces of the New Republic throughout the galaxy. But all pales before the vast armada of gunships, assault transports, cruisers, Star Destroyers and giant Battlecruisers in orbit over Byss and even these behemoths are overshadowed by the brooding menace of Palpatine’s flagship – The Soverign. The New Republic has withdrawn from the Core Worlds, with the exception of a few critical strongholds such as Metellos, Anaxes and Brentaal-IV determined to slow the Imperial advance at a heavy price. With the fleet regrouping over Da Soocha 5, the shipyards at Bilbringi and Kuat have been deploying Republic-class Star Destroyers to boost ageing fleets of medium frigates and cruisers, while the secret shipyards of Hast and Krinemonen-III have been producing state-of-the-art Mon-Calamari frigates, cruisers and capital warships to strengthen the new bases in the Outer Rim Territories, with brand new E-Wings from Norval II adding additional punch to the starfighter force. In these desperate times, weakened by the loss of Luke Skywalker to the Dark Side, the Republic must strike at Byss and destroy the Dark Empire and the Emperor at its source before the galaxy is consumed by the Sith. Operation Shadow Hand is reborn. The key to accurately portraying Operation Shadow Hand accurately was simply to go back to the original source material - Dark Empire graphic novels and the Dark Empire Sourcebook. Where possible, the composition of all forces has been taken straight from the art of the Dark Empire and care has been taken to accurately portray every blip, indistinguishable dagger and ship class as closely as possible. We are therefore pleased to announce the addition of several new Imperial units to the campaign, starting with the World Devastator. These capital-class terror weapons come with exceptional shielding and a good array or turbolaser cannons, and of course the Molecular Furnaces, which produce an almost limitless quantity of automated fighters- TIE Drones- in neverending waves. At point blank range, these furnaces can be turned upon enemy warships, consuming them utterly. And finally, if WD’s survive the space conflict and are part of the blockading fleet above an enemy world, those same molecular furnaces are capable of sucking enemy ground bases right off the map! Titus Klev commands a squadron of these war machines in preparation for the assault on Mon Calamari, while the remainder are stationed above Byss. Operation Shadow Hand is also the campaign most closely associated with the Dark Side of the Force, and to that end two new starfighters closely associated with the Dark Side Elite have been added. The first is Luke’s personal transport (also flown by Sedriss) – the I-7 Howlrunner. Although the latest in the Incom Line, it was designed by those Imperial scientists that did not defect to the Rebel alliance along with the X-Wing schematics, and the old stigma has resulted in limited acceptance with the Imperial Fleet. The ship is sleek and fast, able to outpace X-wings, and with superior performance to the Tie Interceptor and although it has heavy shielding, the twin laser cannons are rather light by Imperial standards and this fighter performs less well in an extended space battle. 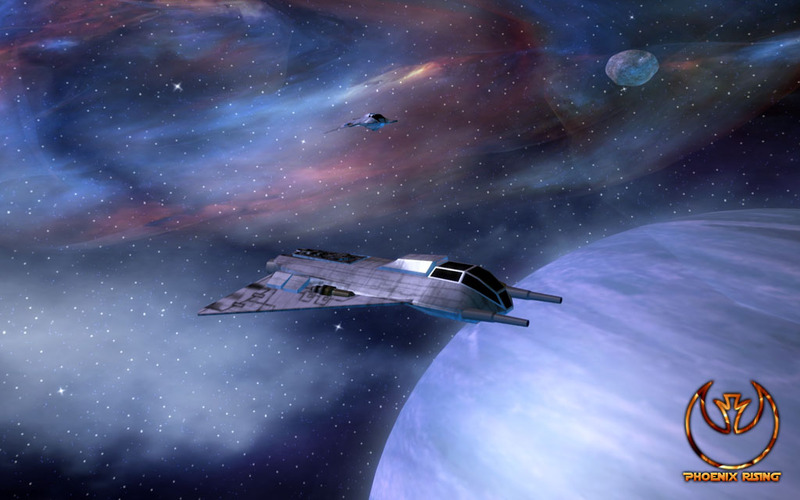 Its high speed makes for an excellent reconnaissance craft, especially when piloted by the Dark Side Elite. Following experimentation into Ssi-Ruuk type entrenchment processes, Umath Lek has extracted the brains of mortally wounded Tie Fighter pilots and implanted them in nutrient solutions into heavy droid fighters, creating exceptional war droids that use the Dark Side of the Force – Shadow Droids. These are easily the nastiest starfighters in the galaxy. With the speed and manoeuvrability to outpace the best Republic fighters and firepower to rival an B-wing/E bomber, these are dogfighters par-excellence, made from warhead-duping stealth material. A squadron can probably outgun an Acclamator Assault Ship! Their only limitation is the lack of a hyperdrive. A full wing of Shadow Droids is stationed on Byss to protect the Emperor. The other major challenge for this campaign was the sheer scale of the conflict. The art of the Dark Empire graphic novels depicts hundreds of ships in orbit over Byss or assembling from the Deep Core. While we cannot hope to have every unique ship in the mod, they translate fairly well into upgraded Mark II and III Star Destroyer variants. 6 Shadow Droid Squadrons; Gamma-class Assault Transports; Lambda T4d Shuttles, Skiprays and Guardian-class Light Cruisers in patrol / defense roles. 2 Immobiliser 418B’s; 2 Taskforce Cruisers; 2 Victory I’s; 3 Victory II’s; 2 Victory III’s; 14 Imperial I; 2 Imperial II; 2 Imperial III SD’s; 4 Tector I; 4 Tector II; 1 Tector III; 4 WD’s; 3 Praetor I-Class Star Battlecruisers a massive Praetor II Star Battlecruiser, Dark Luke, Singularity & Soverign! Even if we ignore the Soverign entirely, there is more firepower in orbit over Byss alone than Grand Admiral Thrawn had under his entire command. We aim to replicate this level of accuracy throughout the campaign, using existing variants where new or currently unobtainable starship designs are shown. However, I can say that Rebel A9’s are in place on Kuat alongside the latest E-Wings, and the occasional Bulwark Battlecruiser is in evidence as a New Republic Command Ship. The MC90 Defiance class - which debuted in this conflict - is currently represented ably by the MC80b variant, and is present at Hast, Kuat and Mon Calamari. We are, however, able to bring you the MC80 Evacuation Cruiser, which Mon Calamari technicians converted from Reef Home Star Cruisers in record time to evacuate civilians during the Battle of Mon Calamari, and the terror of the World Devastators. Darkness has shrouded the galaxy, and many independent worlds have joined the arms race to survive, with Palpatine’s influence spreading fear and aggression, and for the first time ever, this is without the stabilising influence of the Republic/Empire. Many worlds such as Aargau are now fortresses, especially since the Invincible-class Heavy Cruiser has been further modernised following the original CSA retrofit in 18BBY and is seen in the Mark II format over many worlds, but this is not the real danger. These violent upheavals have devastated many worlds and as a result, pirates, outlaws and organised crime syndicates have made the most of the situation, rapidly expanding their activities, especially since the recent development of the StarViper-class Attack Platform. This is a murderous pirate craft, heavily armed and shielded. 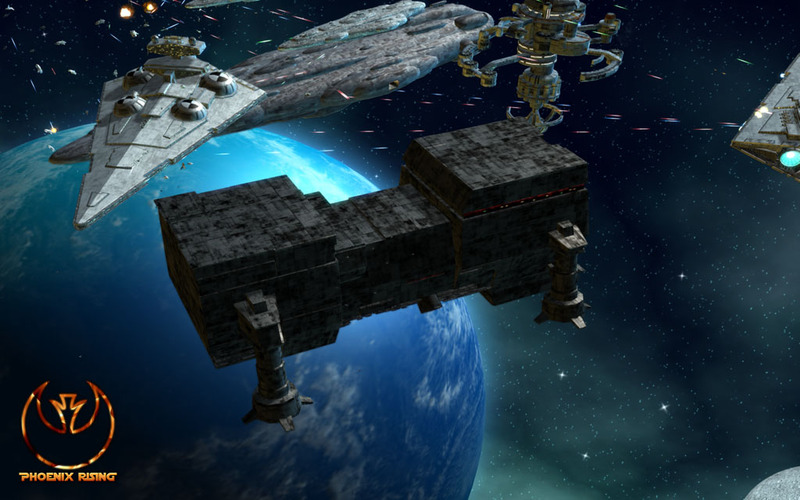 Worse still, many criminal organisations have made increasing numbers of illegal craft, both large and small, from salvaged battle debris leftover from the recent conflict with Thrawn, and shadowports such as Columex and Nar Shaddaa are not to be entered lightly. Given the scale of the Imperial Fleet, it is only a matter of time before the Core falls. Once the last bastions of defence crumble under the onslaught the last few Republic worlds will be rapidly overwhelmed. The last remaining hope is to collect every last ship in the Outer Rim and plunge towards Byss in an attempt to destroy the Dark Empire at its very heart. This is an explosive campaign with titanic fleets and conflict on an unimaginable scale, together with a new, more detailed vision of the Deep Core and the Dark Empire. ….We of the New Republic are pledged to end this long night of misery. We are pledged to defeat and destroy the Empire and restore the Republic to the Galaxy in fact and name. Those who are currently under the threat of despotism and anarchy know this: the New Republic is committed to justice and peace and will fight to free you. Join us if you can. Mon Mothma’s holomedia broadcast following the Imperial siege of Caprioril. Edited by Phoenix Rising, 20 July 2010 - 05:37 PM. ...but seriously, give the Emperor the Eclipse. You are doing him a disservice. ...give the Emperor the Eclipse. You are doing him a disservice. I believe the model included in FOC vanilla had no hardpoints, and is therefore currently unusable as a unit. I'm sure it's on the wish list, but super-dreadnaughts are pretty horrible to rig. The Soverign actually works - hence it's use here. Edited by Ghostrider, 20 July 2010 - 12:16 PM. Update the index . I'm curious to see the stats of the new units . Welcome news indeed, good sir Ghostrider! I do like how you guys are trying to standardize the fleet into known ships, rather than try and create a new class for every bulbous Star Destroyer variant depicted in the graphic novel. Be it completely intentional, or just because you have no models for them, I think it's a step in the right direction. I really don't see the problem, since the Eclipse and Sovereign are pretty much interchangeable. What differences there are in Shield/Hull stats, or weaponry, can be depicted by adding those onto the "Eclipse" variant of the Sovereign-class, if it was really necessary. Testing the Byss fleet with Tector III's in the vanguard is rather fun too! My take on that was to find an equivalent firepower variant. For example, the Dark Empire Sourcebook talks about Kuati destroyers, which often have a munitions role - from there it was a quick step to have missile toting Victory III's as the 1.2km variant with power to weapons AND full salvo, and have advanced Tectors as the super heavyweight battlecruisers. Even so - redoing OSH from scratch has taken 3 months. This route at least gives a practical solution, as trying to depict every random (and often completely uncategorised) blob would take years. Ultimately, I believe this is more rewarding because it shows how each product line develops from the early GFFA era right through to OSH some 30 odd years later! It also makes for one Hell of a task force! 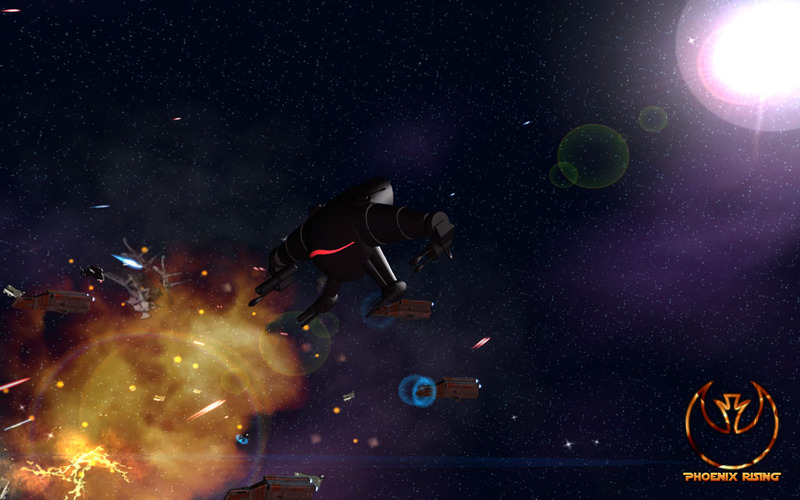 From the World Devastator screenshot it seems the Mon Calamari cruiser still have rapid firing turbo lasers. Does this mean the extra required bones have not been added yet? That screenshot has the MC120. I'm not sure if PR got around to boning (Lol) that model, but I do specifically remember hearing that the MC80 models were boned (LOL) correctly. Nice update! How many planets in the campaign? Argh, the lack of bones on the Alliance's capital ships was the reason I never chose their faction. I really hope PR gets to fixing this. 56 Planets, many of which have been created just for this campaign, with much more Deep Core detail than before. It's not the biggest campaign in terms of planets, but it is in terms of fleets! Note - the Deep Core planets provide a variety of routes to Byss, some obvious as a fortified front door, but if you are clever, you can find some weaker worlds as a back door route to the Empire's capital. For the sake of campaign flavor and authenticity, I can't disagree. Statistically... it's basically the same difference. I don't think we can call OSH complete without the Eclipse, but it's going to have to wait for another release. If I'm going to do that many bones, I'd prefer a new model first. Gah, that's pretty blatant, isn't it? You're right - I haven't done it yet. It'll be done before the release. Good thing I noticed it ^^. I would've done it either way. looking awesome. huge thanks to both PR and Ghost for all your hard work, and to anyone else who has contributed. looking forward to future update, keep up the great work! that sounds amazing - although I thought the Dark Empire series occupied an odd place in EU, i feel like it really hasn't been explored enough. What better way to do than this? Just special starting units. As a rule, I don't want anything to be buildable that can't upgrade, and it didn't make sense to put these on the tech tree. It's the foundation of the EU, in many ways. There's something like a year and a half that the campaign covers and I can't think of another source that overlaps it. The same is mostly true for the Thrawn Trilogy. It's a shame they seem to have moved away from adding anything new to this time period though; we've generally had to get by on singular references, like "another detachment of fighters just arrived from Norval II" or an example of a commando mission to Hettsk. I did think that the DE era was somewhat too soon after Thrawn: mere weeks after a tactical genius almost dominates the galaxy, the hench honcho then turns up and acheives in days many of Thrawn's goals with sheer numbers and firepower. It just seemed alittle oer the top after the thrawn trilogy. Looking forward to the revised campaign though! Out of interest, are there plans at all for a post-Yavin, but pre-Endor campaign? Just a thought. Essentially the move from small secret bases, to more substantial ground forces and fleets for the rebels. "While it was imprudent to reveal his (Palpatine's) return, he could still hinder or aid those who caught his fancy. It was, in fact, the Emperor who had given all the various orders and counter-orders that were impeding the petty plans of the various factions. Here then was the reason so many of the warships Thrawn needed had vanished into the fortress systems, forcing him to rely on the Katana fleet of lost Dreadnaughts. It was the Emperor, also, who ordered that the construction of new palaces and his flagship continue. All in preparation for the day when he would announce himself to the galaxy and take his throne back." With the demise of Thrawn, and with a cloak of Dark Side energy throughout the galaxy, that day has come! As to another campaign. we have postponed any serious discussions of new campaigns until V1.3! Edited by Ghostrider, 21 July 2010 - 01:22 PM.